“The Prince of Egypt,” the popular DreamWorks Animation musical film, has come to life thanks to a collaboration between TheatreWorks Silicon Valley and Denmark’s Fredericia Teater. This world premiere features additional songs by Stephen Schwartz of “Wicked,” “Godspell” and “Rags” fame and is directed by his son, Scott Schwartz. It tells the epic biblical story of Moses and the Hebrews’ escape from Egypt as related mostly in the book of Exodus. This version focuses on events leading up to the flight, especially the more human story of the complex relationship between Moses (Diluckshan Jeyaratnam) and his adoptive brother, Ramses (Jason Gotay), who became Egypt’s pharaoh. As young men, they’re carefree hell-raisers, but the passage of time gives them new insights and responsibility. With the death of his father, Pharaoh Seti (the regal Tom Nelis), Ramses becomes pharaoh. In the meantime, Moses meets his real brother and sister, Aaron (David Crane) and Miriam (Julia Motyka), learns he’s Hebrew and marries Tzipporah (Brennyn Lark). Ramses, too, is married to Nefertari (Jamila Sabares-Klemm), mainly for political reasons. Moses is torn between loyalty to his adoptive family and the pull of his Hebrew roots, especially since the Hebrews are longtime slaves to the Egyptians. Director Schwartz employs imaginative staging on Kevin Depinet’s spare set with its movable sandstone blocks and Shawn Sagady’s projections. Also figuring into the staging is Sean Cheesman’s creative choreography, a strength of this production. Musical director William Liberatore conducts eight other musicians from the keyboard. Many of the 28 performers are in the ensemble, playing various ethnic groups, dancing and forming scenic elements. The cast is solid, especially the featured women. However, Jeyaratnam doesn’t have the stage presence needed for Moses. Although this musical springs from an animated film popular with youngsters, its mature themes aren’t suitable for them. It’s also quasi-operatic, with much of Philip LaZebnik’s book propelled by Stephen Schwartz’s music and lyrics, requiring better diction than heard from some of the singers. Two of the more memorable songs are the introductory “Deliver Us,” sung by the ensemble and others, and “When You Believe,” sung by Miriam, Tzipporah and the Hebrews. At two and a half hours with one intermission, the show is still a work in progress that sags in spots. Presumably that issue will be resolved over time and through subsequent productions in Denmark next year and elsewhere. 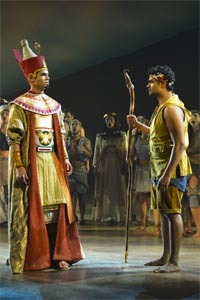 “The Prince of Egypt” will continue through Nov. 5 at the Mountain View Center for the Performing Arts, 500 Castro St., Mountain View. For tickets and information, call (650) 463-1960 or visit www.theatreworks.org.